The first thing you'll notice is the lovingly restored Craftsman home of Karen Merriam and Thomas Bevilacqua, who has lived here for about 30 years. But take a closer look at the thoughtful landscaping and you'll see what makes it extra special. The yard has weathered flooding from storms so they've taken a survivalist approach, now thriving with variety: flowering with gardenias, drift roses, loropetalum, dianthus, vincas, day lilies, and liriope; oregano, thyme, basil, rosemary, and satsuma tree for flavor; crepe myrtles for shade; and Asian jasmine for ground cover. This tidy no-grass and low-fuss yard was arranged by local design architect Pam August, and installed a few years ago by Bella Terra's Humberto Bolanos. Honorable mentions received from neighbors this month go to 601 Woodland and 528 Bayland. Thanks for sending nominations! 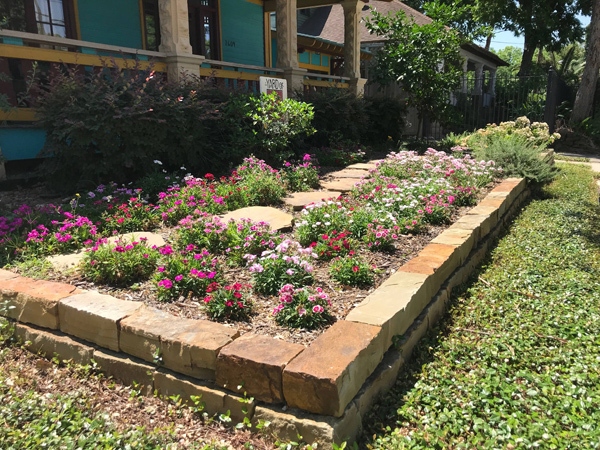 If you see a lovely yard you would like to nominate, please email the address to beautification@woodland-heights.org. Thank you!